Nestled along the beautiful Tawas Bay shoreline in scenic Northeastern Michigan, the Tawas Bay Beach Resort is the ideal place to stay while you enjoy this four season playground! With eight fun and challenging golf courses nearby, swimming and boating in the summer, breathtaking fall colors during the autumn, and Nordic skiing and snowmobiling in the winter, there is always a reason to visit us on Michigan's Sunrise Side. 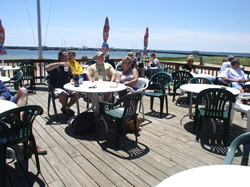 Dining and entertainment include Bayside Restaurant, Bayside Lounge, and Bikini's Beach Bar - a Caribbean feel in northern Michigan all season long! Boats, waverunners, paddle boats, and pontoon boat rentals available through SunnyBunns.